It should be noted that in most jurisdictions it is necessary to obtain an electrical permit in order to convert from a fuse panel to a circuit breaker panel. Usually this type of permit is only granted to licensed electrical contractors. Failure to do so can lead to fines and utilities disconnecting power to your home. 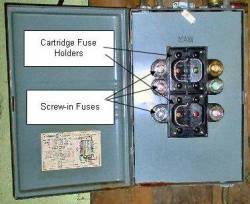 Electrical distribution fuse panels, as shown in Figure 2 have become obsolete and in many jurisdictions a homeowner cannot get home insurance if they have an old style fuse panel installed. Although a properly installed fuse panel is safe, insurance companies see the convenience to over size the fuse on a circuit as a potential hazard. 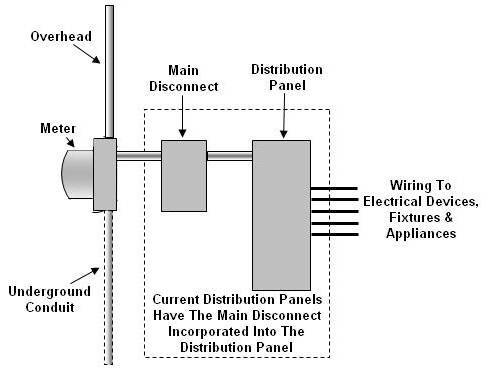 If you are converting from a fuse panel to a circuit breaker panel, known in the trade as a load center , as shown in Figure 1, because your home needs more power, then you must have the utility replace the incoming feed wires to your home. Just installing a new electrical distribution panel or load center with more circuits will not provide your home with more power if the incoming service is not changed. The wires coming to your meter are sized based on the service provided. More power means larger gauge wires coming into your home. If you have a fuse panel then the main disconnect will most likely have cartridge fuses installed, rated at the load acceptable for the home. If you have sufficient power, and only want to change the current fuse panel to a circuit breaker panel, leaving the main disconnect as it is with the cartridge fuses, then the electrical parts that you require can be obtained at most of the big box home improvement stores, online, or at an electrical wholesale. 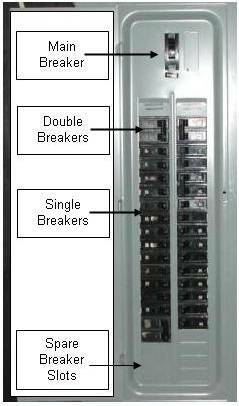 Make a list of the number and sizes of circuit breakers that you will require. The breaker size is based on the gauge of the wire that is being used to run from the distribution panel to the device or appliance. Do not assume that the screw-in fuse rating is correct for the wire size or circuit. People have a tendency to increase fuse amperage ratings as time progresses. Charts on correct wire gauges for different amperes. Purchase a panel that has more circuits spaces than you currently require so that you will have available spare breaker positions for future additions. There should never be more than one wire on any fuse or breaker terminal. If there is more than one wire on a terminal count each wire as a separate circuit.